0-17: LGBTQ representation (and the lack thereof) in the Marvel Cinematic Universe – AiPT! Despite speculation otherwise, “Thor: Ragnarok” is devoid of queer representation. The MCU’s batting average? 0-17. Thor: Ragnarok, the latest chapter in the Marvel Cinematic Universe film series, is out in theaters, wowing moviegoers. 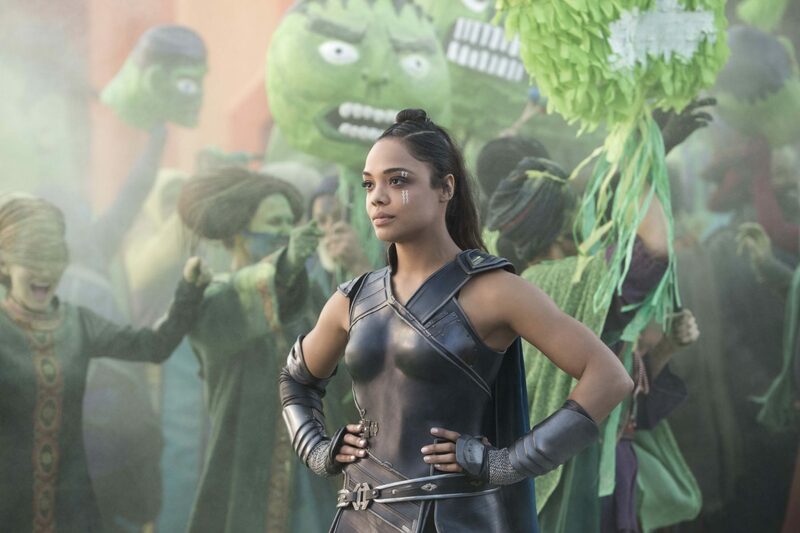 Reviews have largely been positive, but there’s one aspect of the film that has received less benevolent press: the sexuality, or lack thereof, of Tessa Thompson’s character Valkyrie. Seventeen films with absolutely no hint of a non-straight person existing. In a 2015 interview, Marvel Studios president Kevin Feige stated that it was possible there might by an LGBTQ character in the MCU within the next 10 years. If the first case of representation were to fall on the latest possible end of that spectrum (2025), that would put the first LGBTQ MCU character’s debut at a whopping 17 years after the universe began (with Iron Man in 2008). On the other hand, if an LGBTQ character were to debut in an MCU film at the soonest possible date, via a 2018 release (Black Panther, Ant-Man and the Wasp or Avengers: Infinity War), that would still equate to a 10-year gap between when the MCU started and when its directors, producers, writers, etc. bothered to show any evidence of non-straight people existing on-screen. If 10 years doesn’t sound like a long wait time in and of itself, let’s further analyze how many MCU films have actually been released in that time frame: 17. Seventeen films with absolutely no hint of a non-straight person existing. On one hand, I have a lot to critique about this fact (and I certainly will). On the other hand, if there’s one positive thing I can say about it, it’s this: they are staying true to the comics’ long history of throwing LGBTQ fans scraps, if anything at all. That’s not to say that Marvel hasn’t made improvements over time, or that I believe that there aren’t multiple people at the company who are trying to provide more content aimed at LGBTQ audiences. This last year has seen the launch of the company’s first two ongoing solo series starring LGBTQ characters, Iceman and America. In addition to those two, Marvel has introduced multiple other queer characters in team books. Wiccan and Hulking, of Young Avengers and New Avengers, are two particularly popular examples. I fear, however, that oftentimes the slightest sign of “progress” is cited as an excuse to discard any complaints or critiques regarding lack of representation. As a child, I got into Marvel first through the X-Men. My brother shared his love of the team with me through badass action figures and some of his old comic books (he was especially fond of Jim Lee’s iteration of the characters). I expanded my reading outward from the mutant heroes until I had checked out and grown fond of virtually every major Marvel property. By the time I was a teenager I had excitedly read through old black-and-white “Essential” volumes of Spider-Man, the Hulk, the Avengers, Doctor Strange, and many more. No matter what I read, however, there was one thing I could almost always count on: people like me not existing. The type of relationship you see in a Marvel film. The U.S. is a country marked by shameful homophobia, transphobia, and prejudice, both politically and socially. This was even more strongly the case when I was growing up, back before even the likes of Glee and Modern Family tried to introduce LGBTQ characters to more mainstream audiences. There was some media headway, with the likes of Will and Grace or Brokeback Mountain, but such shows and movies were widely looked down upon by people who had never even watched them. Brokeback Mountain, a movie which ends with one of its two male lovers being beaten to death, was thought of not as a tragic drama, but as an endless source of comedic fodder. Many lazy comedians, in reaction to the casting of Heath Ledger (one of Brokeback Mountain‘s leads) as the Joker in The Dark Knight, unleashed all manner of “Brokeback Batman” jokes. Imagine having the only examples of yourself that you like in a form of media be two (only two!) characters who had never even sustained solo series, and whose team book content was also very limited. Heath Ledger wasn’t even gay, but the stigma surrounding homosexuality was so strong that an actor so much as playing gay once inevitably led to further gay jokes at their expense down the line. Meanwhile, when I wasn’t in the car listening to homophobic comedians on the radio, I was listening to homophobic peers and teachers. I was either fearful to come out or, later on, fearful of what people would do to me after having come out. My end point of all this personal information is, that no matter how cool Wiccan and Hulkling were, they weren’t enough. Imagine having the only examples of yourself that you like in a form of media be two (only two!) characters who had never even sustained solo series, and whose team book content was also very limited. It’s this sort of limited existence that makes books like Iceman and America amazing. LGBTQ kids (and adults!) need representations of themselves in fiction, just like everyone else does. We as a culture look to comics, among other genres, for heroes. We look for examples of who we would like to be, of who is worthy of our emulation. Prejudices, of course, impact who these figures are. With how widespread homophobia is in this nation, how firmly ingrained it is into the very concept of Americana, is it truly surprising that it took until 2017 for LGBTQ characters to receive solo series from Marvel Comics? “I don’t see why this is newsworthy,” certain online figures complain when attention is paid to LGBTQ firsts in the genre. I’m not going to bother explaining it to them–truthfully, they don’t want to know. But, as I said, progress. It sucked being a little gay boy with absolutely no one like myself in the X-Men, no example in media of someone being gay and beloved by communities at large. Then, Wiccan and Hulkling came along and, though they didn’t move the overall cultural needle, they were still figures I could admire in a special way, and who meant a lot to me emotionally. Now, we have the Iceman solo series, which has me more excited than any other Marvel comic since I first learned of Wiccan and Hulkling’s existence over a decade ago. Sadly, the Marvel Cinematic Universe has made no such progress. It’s sad, considering how much more impactful progress would be there than in comics. The films reach a much wider audience than the comics do. You have to go out of your way to buy a comic book, much less one with characters who aren’t straight. Just about anyone could envision going to see some Marvel film or other, though. Some gay little boy, or scared bisexual girl, or any other specific LGBTQ person struggling to find examples of people like themselves being loved, could potentially go see a film starring superheroes, pinnacles of our culture’s values, and feel included. But as is, they can’t. Even more ridiculous than this fact, is the fact that some MCU creators have denied it. Guardians of the Galaxy director James Gunn stated earlier this year that LGBTQ characters might already exist in the MCU, and we might just not know about them. The worst part of his statement was when he claimed that very few Marvel characters have had their sexuality explored on the big screen, regardless of if they were gay or straight. How odd that, in a universe where almost none of the characters supposedly have their sexualities explored, every single core member of its popular group franchise, The Avengers, has been shown in a heterosexual relationship or otherwise feeling heterosexual attraction. I mentioned earlier that there have, to date, been 17 films in the MCU. Let’s examine the degree to which characters across those 17 films have been sexless beings, with no exploration of heterosexual feelings or relationships. Iron Man? Has his romantic interest Pepper Potts. Thor? He has Jane Foster. Captain America? Not only did he have a romantic interest in Peggy Carter, but also in her own niece, Sharon. Hawkeye has now been shown to have a wife and family, and the Hulk and Black Widow had a thing going in Avengers: Age of Ultron. How odd that, in a universe where almost none of the characters supposedly have their sexualities explored, every single core member of its popular group franchise, The Avengers, has been shown in a heterosexual relationship or otherwise feeling heterosexual attraction. Let’s look outside of the Avengers characters for a moment as well. Did Spidey show any interest in women in his film earlier this year? Yep. Ant-Man? You betcha. Even the film franchise Gunn himself directs, Guardians of the Galaxy, shows very clear romantic tension between Star-Lord and Gamora. Remember all the GOTG2 trailers acknowledging this pair’s romantic tension? So, despite Gunn’s claims that the MCU hasn’t gone into its characters’ sexualities at all, the reality is that you’d be hard-pressed to find a major character in the MCU who hasn’t had a fairly significant amount of screen time devoted to their romantic and/or sexual attractions. With that said, we’re still supposed to believe that Valkyrie’s bisexuality isn’t addressed on-screen because there was important exposition that needed the screen time more. Speaking as someone who has seen almost every film in the MCU to date: “Nonsense.” If Captain America hitting on his ex-lover’s own niece is deemed important enough to make a film’s final cut, but a fleeting moment acknowledging Valkyrie’s interest in other women isn’t, there’s more at play than just screen time limitations. “Vital exposition.” That’s what Valkyrie’s bisexuality was cut out to make room for. Meanwhile, major and minor characters all throughout the MCU have had relationships and attractions that were considered vital enough to show on-screen. If straight people and characters are considered vital enough to pay attention to and represent, but LGBTQ characters aren’t, and that trend extends over an entire decade and 17 films, is the problem worth ignoring as much as our culture collectively has? More on-screen romance, in the mighty Marvel manner. The long wait aside, Kevin Feige has stated that LGBTQ characters might appear in the MCU by 2025. That raises the question of who they might be. The most promising upcoming film is likely Black Panther, given the current comic book run’s inclusion of lesbian lovers among the ranks of the Dora Milaje. The inclusion of a lesbian relationship in the film is still, however, only a possibility, and far from a confirmed reality. Who else, then, could the first LGBTQ MCU character be? The live-action Beauty and the Beast film is perhaps as likely a template for the amount of queer content to come as any other. Several prominent options are off the board due to Fox’s ownership of the X-Men and their related characters. With Iceman and Northstar off the table, that leaves Marvel with little but (other) C-listers to choose from. For this reason, it is almost certain that the first queer character in an MCU film will be a supporting character at best. Wiccan and Hulkling are certainly possibilities, but no Young Avengers or other young hero-themed MCU film has been announced. This also strikes out Karolina Dean unless Runaways ends up receiving not just a TV show but a film as well. America Chavez is an unlikely inclusion for similar reasons. With all of Marvel’s main (read: B-listers at best) queer characters either under Fox’s legal umbrella or tied to properties with no announced films, the identity of the MCU’s first queer character is hard to guess. It’s always possible that a queer character will be introduced to a film franchise from which they don’t originate, or that the first queer character in the MCU will be some no-name with almost no time spent actually addressing their sexuality. The live-action Beauty and the Beast film is perhaps as likely a template for the amount of queer content to come as any other. When I was a little boy, I fell in love with Marvel Comics. I may have been born too late to be a merry marcher, but I still make mine Marvel. These characters, their worlds, and their struggles matter to me. If a Marvel film ever makes me cry, it will likely be one that brings Wiccan and Hulkling to the big screen. But until then, I’ll keep watching the movies that interest me and marvel at how important straight relationships are deemed to be, even when they do nothing to advance the plot. I’ll marvel at how a few seconds’ glimpse of a woman liking another woman, on the other hand, is too distracting to include. On occasion, when I’m feeling hopeful, I’ll marvel at the thought that maybe, just maybe, lives like mine will one day matter to the people crafting the stories that mean so much to me, and to so many people who never get to be a part of them.